Posted on August 3, 2012 November 5, 2012 by Emily S.
ever since january of 2009, i’ve wanted a vespa. i drove one on my 3rd day in australia studying abroad and fell in love. the freedom, wind in the face, ocean air (in au) and just pure joy of riding one had me hooked. over the next few years i spent (ok, wasted) a lot of time looking for one when the time just wasn’t right. i found green ones, baby blue ones, fast ones, slower ones, and vespas that just won my heart over but alas i was renting a house, paying for school, and driving an 1995 corolla. a scooter was NOT a smart choice. my coworker was a big vespa fan and we talked vespa a lot at work. in fact, he had a few of them, one being a stella with a side car. bright pink that was his wife’s that he told me we could use! well, once chris and i got engaged, it was engrained in my mind that we would ride from the ceremony in a vespa with a sidecar, no excuses. for various reasons, my coworker’s stella was not up for grabs any longer. 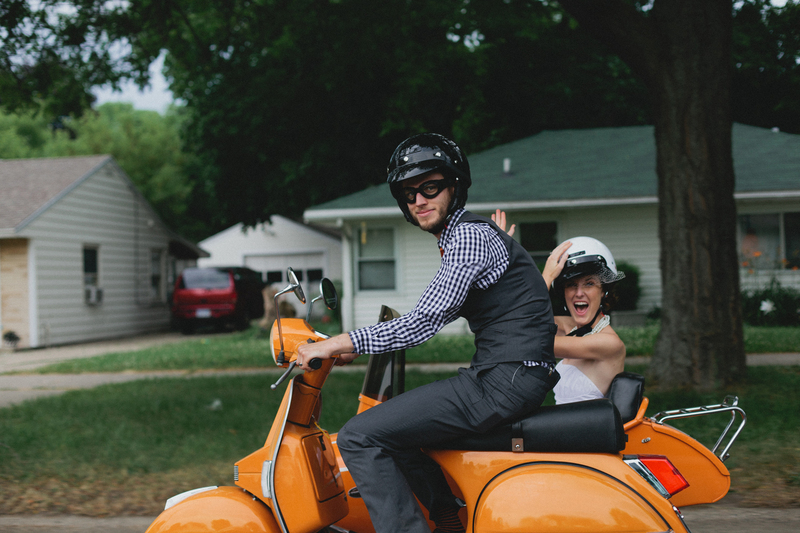 we had a wedding coming up and i wanted a sidecar – so to craigslist i turned. every morning i would wake up and check craigslist on my phone to see if there was anything. day after day, nothing that quite met my fancy. then, one friday morning in april, i found one. this one wasn’t going to be a 3 day drive to retrieve either, someone in jenison was selling it – right in our backyard. i called chris on his lunch and told him we were going to look at this orange vespa with side car. he agreed and we met after work in the mcdonald’s parking lot. after a few tense conversations about what we were doing, what the heck we would offer, and if we were crazy, we pulled up at terrance’s house to test drive the stella with sidecar. nevermind the fact that neither of us knew how to drive a manual scooter or had our motorcycle licenses. fortunately, terrance was gracious enough to take us each for a spin and let us each drive it. and we were in love. a half hour later we had bought a scooter. with no knowledge of how to drive it, no place to store it, and no budget to really spend on something like this, we drank lots of wine that evening as we questioned what we had done. for a few weeks afterwards, we referred to it as “the purchase”. the sentiment i felt in australia was gone. we had made our first big purchase together, and all we could muster up the conscious to call it was “the purchase”. fortunately things only went up from there. we stored it at my parent’s house and took drives around their neighborhood. i stalled it numerous times and sometimes couldn’t start it. chris was diligent and took the test to get his endorsement – we were one step closer to riding away in a scooter with a sidecar from our wedding. and so it was. 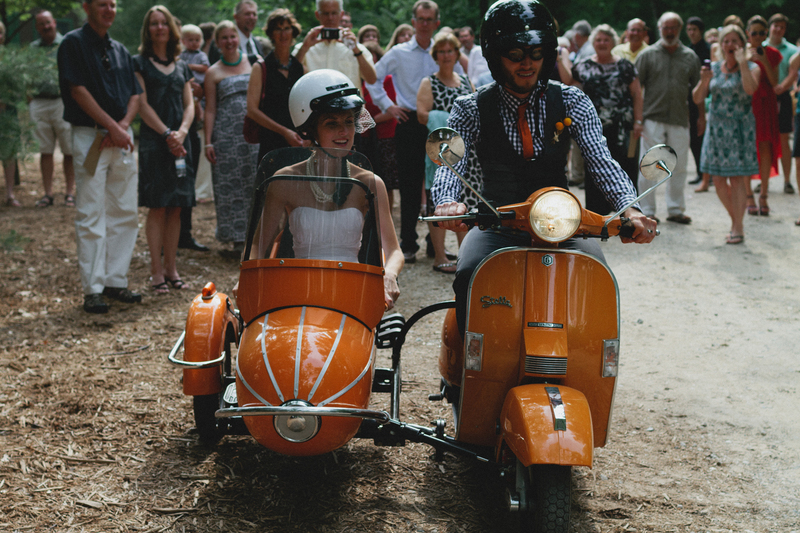 june 16th and chris drove the scoot all the way up to camp roger for our ceremony. all shiny and clean we said “i do” and he whisked me off my feet into – a sidecar. i was the proudest bride ever, riding next to my husband in our scooter. our mobile. our scoot. since then, we’ve had many a journey on the scoot – adventures in east grand rapids, smiles, finger pointing, and offers to buy it right off of us. it’s our toy that after a long day of work, we can’t wait to hop into. we ride with smiles and enjoyment, wind in the hair. Posted in lovely things, on marriage, pure joy. Emily…congratulations on your wedding and “the purchase”. Awesome to see you both happy and enjoying time together. Enjoy….